DEPOSIT: A deposit of 35% of the total rental rate, not including tax, is required upon booking. (When booking through alternative avenues such as VRBO & AirBnB, reservations are subject to higher deposit rate). Full payment of the reservation balance is due 60 days prior to arrival and 90 days prior to arrival if any days fall within peak season (December 20- April 15 & June 15- August 15). No reservation is confirmed until the initial deposit has been received and acceptance of reservation policies and procedures is on file. DAMAGE FEE: Monte D. Fitts, Realtors has the right to charge the credit card on file to pay for any charges due to the misuse of the unit and its contents. If reservation is made though an outside vender charges due to misuse will be taken from the deposit required by their booking service. PROCESSING FEE: A processing fee of 4% of the entire booking total will be applied to your reservation. (Fees will vary when booking through an outside vendor and will not be subject to the 4% processing fee). EXTRA FEES: Guests are subject to and liable for certain charges that are not included in our rate which as they are not under the control of Monte D. Fitts, Realtors or The Whaler Vacation Program. There are fees set by The Whaler’s Homeowners Assn. and by their on-site management company, (currently Aston Hotels). These include but are not limited to those listed below and are paid by providing a credit card to The Whaler Front Desk upon arrival/departure. *Please note all fees are subject to Sales Tax of 4.166% and could be changed at any time. Resort Fee: $25.00 per night plus tax and are to be paid directly to the “The Whaler” Front Desk upon check-out. (subject to change) This fee includes parking, enhances cable T.V., free Wi-Fi in each unit, beach/pool towels, use of beach chairs, use of the gym, sauna, BBQ’s, tennis courts, and free use of the washer/dryer on each floor. Phone Charges: long distant telephone calls are an additional charge plus tax. • EXTENSION: The length of your stay may be extended subject to availability; however, a new Rental Agreement must be signed, and additional rental charges, taxes, and cleaning fees collected prior to extension start date to confirm extension. • REDUCTION: All reductions in your length of stay must be submitted in writing more than 90 days prior to arrival and are subject to a minimum stay. Adjustments in nightly rental rate may apply by reducing the total number of nights rented. Reductions in your length of stay made 0-90 days prior to arrival will not result in a refund or reduction of rent and taxes. TRAVEL INSURANCE: Because we adhere to our cancellation policy and care about the investment you have made in your trip, it is encouraged that you obtain travel insurance. CSA Travel Protection can be ordered online at http://www.csatravelprotection.com or by phone at 1-800-661-6860. CSA requires that insurance be purchased prior to final payment. CSA Travel Protection is independent of Monte D. Fitts, Realtors. A one-time check-out cleaning fee will be applied to your reservation and the cleaning charges are not included in the nightly rate. Necessities: **PLEASE NOTE: Unlike a hotel, a rental condominium is a ‘home-away-from-home’, therefore all groceries and items other than those “starter supplies” that we provide, are the responsibility of the guest to purchase. “Starter Supplies” will not be replenished during stay unless additional cleaning is purchased or provided. Our units’ kitchen’s come equipped with cookware, cooking utensils, knives, flatware, dishware, serving ware, drink ware, electric coffee maker, toaster, blender, and tea towels. In-Unit Washers & Dryers: not all units have washer & dryers in them, and we suggest that you check with us prior to booking if this is something you require. However, as mentioned above, FREE washers and dryers are located on every floor next to the elevators and in both towers. (Please note that laundry detergent IS NOT included). Linens & Towels: all beds will be made with fresh linens upon your arrival. Bathrooms will have several sets of towels, with a couple of spare sets. Should you require more, extra services can be arranged at and additional cost. Please contact our office, at 808-667-9703, and we will be happy to assist you with the pricing. Early check-ins and late checkout requests made closer to the arrival or departure date must be made no sooner than 48 hours prior to arrival/departure. Requests for late checkouts are subject to a minimum charge of 1-night stay. If you have a late flight, we recommend you book the unit for an extra night if you wish to guarantee availability of the unit after 11am. Occupying the unit after 11AM without approval from our office will be subject to a fee up to the amount of 1-night stay. SERVICE ANIMAL POLICY: As required by The Whaler on Ka’anapali Beach Association of Apartment Owners, (AOAO), a copy of the service animal certificate along with a copy of the handler’s identification must be submitted to them by our company, The Whaler Vacation Rental Program. Therefore, upon making the reservation, guests are required to submit these documents to our company before we can finalize the reservation(s). These documents may be sent to our company by either mail, fax, or email. Guests will be supplied the details for the sending at the time of making the reservation(s). DISCLOSURE: The price of staying in paradise may include pests such as insects, rodents, strong sun and dangers in the ocean. We ask that you be aware of your surroundings and take appropriate precautions. Monte D. Fitts, Realtors manages properties for individual owners. Each owner furnishes their property as they wish within quality standards. Reservations are considered short-term lease/rents with the individual property and owner. ***NOTICE***: For September 2019 bookings, the pool will be closed for tile replacement. 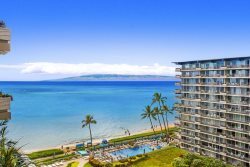 However, guests will have private access to the pool at the resort next door, at the Kaanapali Beach Hotel. Just a few steps away, you will be able to enjoy their other pool amenities as well, such as a tiki bar and restaurant.